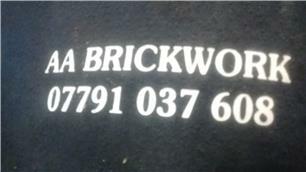 Thank you for considering AA Brickwork. We are a family run local business with over 30 years experience in the building industry specialising in all aspects of brickwork. We can undertake extensions, house building, garden walls, hard landscaping, patios, renovations and pointing. We are very reliable, trustworthy and committed to every job we do. Fully qualified City & Guilds, CSCS Health & Safety & Fully Insured.